If you ever move to a new city it’s important to bike around it. I knew this when I moved to Stamford in 2004 from a small town in rural New Hampshire. I quickly realized how pointless it was to drive anywhere and found that on a bike I could explore places faster and without any blind spots. Also, in a stressful move like the one I’m doing now, exercise of any kind helps and the bike & Caltrain combo makes it easy to #choosethebike when I want to explore a neighborhood. So one day I was riding my Bike Friday a little ways from the San Jose Diridon station, still trying desperately to bond with California and get my head around the idea of moving there permanently when I just happened to look over to my left and noticed a tan warehouse-looking building off in the distance. I had found Good Karma Bikes, which is located at 345 Sunol Street. If you’re like me, when you walk in you get the immediate feeling you’ve come to the right place even if you weren’t looking for it to begin with. I liked donating time, bikes, parts, tools or some combination of the four to organizations under Eastern Standard Time, and during my final days in Stamford I began to miss them terribly: The Trifigura Work & Learn Business Center at Domus in Stamford, The BikePort Co-Op in Bridgeport, The Ohio City Bicycle Co-Op in Cleveland, and, of course, Bike Rodeo & Tour de Red Hook - which is taking place this year at Red Hook High School on May 16th. 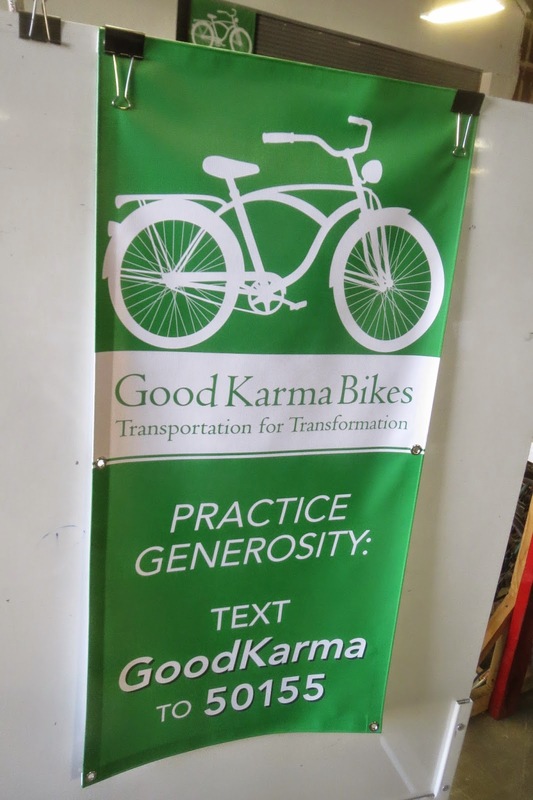 Good Karma Bikes, as I quickly learned, has those values. It was founded in 2009 when the founder saw a homeless person fixing a bike and decided to help. Since then they’ve made over 30,000 repairs and boast a cool statistic: for every bike repaired with a fee, 1.6 bikes are fixed for free. It’s also a secondhand bike shop, which means people can get access to bikes, parts and tools they may not otherwise be able to afford. And if you’re fortunate enough not to need those services yourself, it’s easy to give them to those who do need it: You can donate anything you want but it’s just $50 to give a bike to someone, $250 to sponsor a mechanic and $1,500 to sponsor a workstation - one that will be pressed into service for around 400 repairs a year of homeless, underemployed and veteran’s bicycles (it’s also a classroom workstation and the sponsor can use it free when Good Karma Bikes is open). The place reminded me a lot of The Ohio City Bicycle Co-Op - especially the main room of secondhand bikes. As you ride your bike, think about how well it is working. Think about the people who you’ve paid money to fix it or the great tools you can afford so you can fix it yourself. Think about the transportation alternatives that are available to you and then realize that there a lot of people out there who aren’t as lucky and need help getting bikes on the road (and people whose livelihood depends on it). If we can't ride our bikes we pull out a $300 smartphone and rant on Twitter. If other folks can't ride their bikes they are financially devastated. Anytime is a good time to donate to a worthy organization, but May 5 is Silicon Valley Gives Day. I know this only because I was sitting in the Red Rock coffee shop in Mountain View a couple weeks ago, wondering which laptop-wielding person sitting around me was going to create the next Facebook, when I looked up at the big dry-erase calendar on the wall (I didn't take a picture of that, but at GKB I took one of this). So before you set off on your bike to go to work please do a little something to make sure people not as fortunate as you can do that very same thing. The link to the Good Karma Bikes donation page is here, and on May 5 I’ll be pausing somewhere between Omaha and Cheyenne to make a donation myself. Share the link and use the hashtag #svgives2015. Make a donation. Spread the word. Help somebody out. Make Silicon Valley even better. Thanks for reading and thanks for riding. Hi, Silicon Valley: Bike to Work Day is Tomorrow!